Are you using the best cable for the job? You may have heard terms like RG59, RG6, RG11, and Slim RG59 but you didn’t know what they meant. There is actually a real difference between these categories of cables and in this series, we’ll explain everything there is about choosing a cable. Everyone knows what a coaxial cable is, right? It’s that fat wire that goes into your cable box, satellite receiver, or into your TV from an antenna. It looks different from an audio cable or headphone cable largely because of its heft. There’s a little more to a coaxial cable than that. 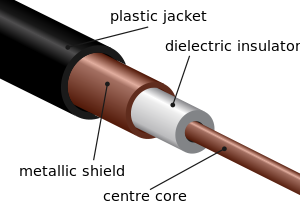 A coaxial cable carries its voltage on the inside “core” wire, and is surrounded by layers of shielding that stop any signal leakage. The first layer, the dielectric, provides distance between the core and the outer layers, as well as some insulation. The next layers, collectively called the shield, keep electrical impulses and radio transmissions out and keep any stray impulses in. Finally, a jacket made of flexible plastic or rubber protects the entire cable. Keeping the entire cable the same size, and keeping out stray signals, are important. 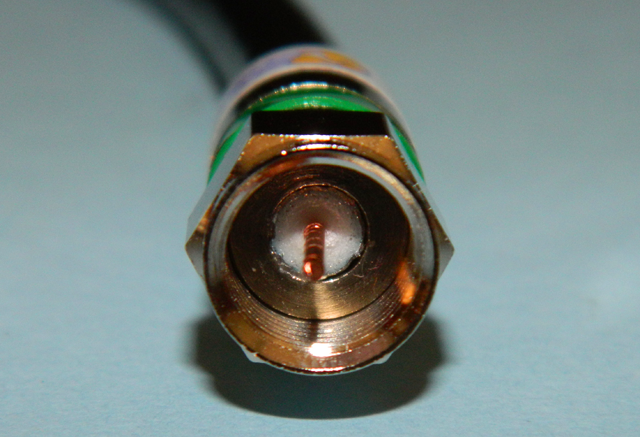 Another important characteristic is that in a coaxial cable, unlike a headphone or audio cable, the core is used as part of the connector. So, it makes a direct connection. This helps keep the signal as strong as possible. 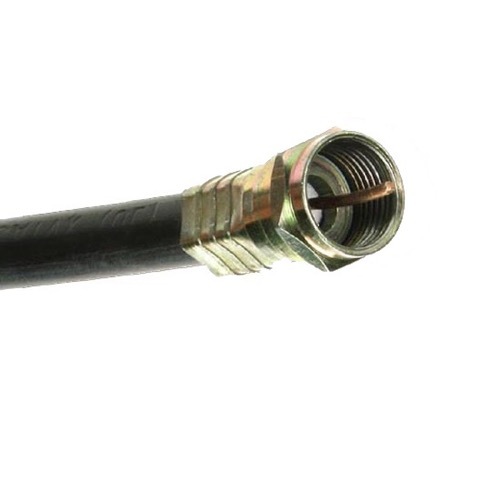 Coaxial cable is perfect for broadcast television and satellite signals, which carry a huge amount of information and are very sensitive to outside interference. A satellite signal cable must carry signals from 2MHz to 3,000MHz. Compare that with an audio cable which just needs to carry signals up to 2 MHz. That’s a massive amount of information. Generally, coax cables will be referred to by a code such as RG6/U. RG is a very old specification that refers to the “Radio Guide,” a military guidebook. Any cable marked “/U” is designed for universal use, as opposed to those cables specifically used for computer data or other specified uses. If your cable is not marked “/U” that’s ok as well. Let’s start with a quick word about RG11 cable. You’re not likely to run into RG11 cable unless you’re digging around in the yard. It’s designed for long runs and not for in-home use. It looks like all other coax but it’s about twice as thick. This is Quad Shielded RG6 cable. We’ll talk about different types of shields in a later article. RG6 cable is the perfect choice for cable and satellite. It is thin enough that it can be coiled or bend enough to go into a wall or ceiling, but carries enough shielding that it can be used for runs up to 100 meters in the house under the right circumstances. This is largely due to the thickness of the dielectric, 4.7mm and the use of a double layer of shielding. RG59 cable was used extensively in homes before cable or satellite. It’s well-suited to carrying signals from a terrestrial antenna but not well suited to long runs through the house, especially if you’re using all the frequencies that a modern cable or satellite system uses. From the outside, RG59 cable looks very similar to RG6. A cable made “to specs” is less than 1mm thinner than an RG6 cable, and can feel similar in its weight and stiffness. However, RG59 cables are only required to have a single outer shield layer, while RG6 must have at least a double layer. Some RG59 cables do have a secondary shield, but like the picture above it can be very thin. RG59 cable is well suited to over-the-air antenna use and is perfect for any case where frequencies don’t go above 1000MHz, such as cell phone antennas. Occasionally, you’ll see a cable that carries the same connectors as an RG59 cable but appears much thinner. Such cables may have some stiffness to them compared to an audio cable but can typically be only 3mm thick. This is referred to in literature as “slim coaxial” or “slim RG59.” In truth this is not an actual standard. Such a cable is built to the same general standards as an RG59 cable — a single shield is generally used — but the dielectric is just 1mm thick, less than one-third the thickness of a regular RG59 cable. Obviously such cables are very limited in their uses. DIRECTV includes one with their wireless Cinema Connection kit for a temporary connection to a receiver. Wi-Ex’s YX545 uses this cable for its antenna, and both Winegard and Mohu use this cable for their flat antennas. For the short distance that they are used, they tend to be just fine. In future CABLES 101 articles we’ll look more closely at the physical characteristics of RG6, RG59, and “Slim RG59” cables and when to use each. Check out more “Cables 101” content here.